You must make reservations at least 5 minutes in advance of the time at Ka Sushi. North Shepherd &amp; 19th St.
KA Sushi in Houston provides a unique experience when it comes to sushi and Asian fusion, with menu options that won’t be found elsewhere. For example, chocolate shrimp is an interesting option with white chocolate, leche and lime zest. Be sure to check out the nigiri/sashimi selection menu items as well including the foie gras + quail egg and seared escolar. The specialty rolls and classic rolls section of the menu at KA Sushi is quite comprehensive as well with interesting names such as miss piggy and captain crunch. Presentations are artful and creative. Finish off the experience with the KA Sushi gome spice pan or cereal killer. 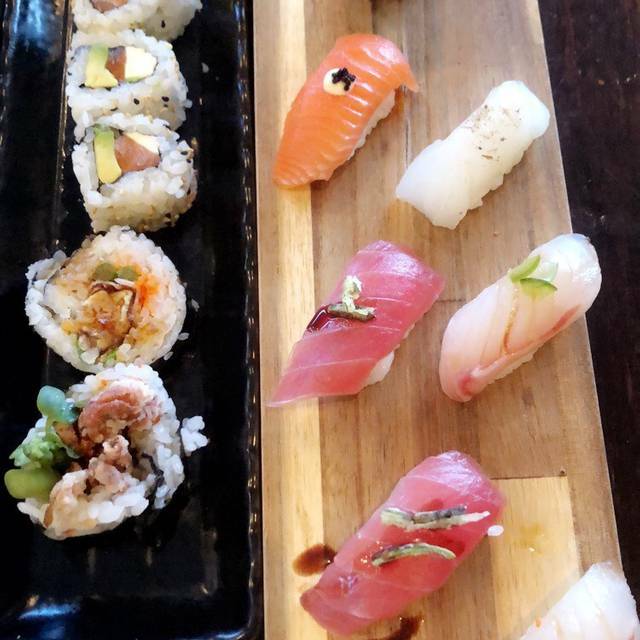 Great food, great quality sushi! Fresh! Some of the best sushi I've had in Houston, and we're particularly pleased that it's close to the Heights. Service and food were great. My wife had The Don which was roasted oxtail with rice and a fried egg. It was great. My son and I had 4 sushi rolls and all were delicious. The wine was reasonable and everything came out quickly. Great evening. Great food and very attentive service. We will be back! We were quickly seated and the food was delivered quick and beautifully presented. Our waitress was very busy but were not needy so it was fine. Will definitely be coming back! Loved the attentiveness of the server. Atmosphere and lighting were great. Food was presented beautifully and everything tasted wonderful. Surprised at how delicious the sweet potatoe roll was. Pretty good sushi for price, great selection across all price points. Some simple rolls left some to be desired. More elaborate rolls like deep sea were on point. Service was good, was left mostly alone. Place was happening at 830 onwards to 930 then cleared out some. Was seated early. Great bar and liquor selection. Would visit again. Amazing sashimi, terrific cocktails, great ambience. Valentines Day 2019. We made a reservation through Open Table in advance, yet they sat us at the LAST table in the back of the place, a very small 2-person table next to the bathroom door. And then they proceeded to sit other couples at other tables - some of them booths for 4 people - more towards the front of the restaurant where you weren’t sitting next to the bathrooms. Perhaps they don’t like Open Table customers and this gift them the worst table in the place??? We’ve been going to Ka Sushi for a while now, but this experience left us very disappointed. Even with an advanced reservation, we waited almost 30 minutes for our table (we declined to be seated by the restroom door). But once at our table, everything was perfect. The waitress was attentive and helpful. The food arrived quickly. Everything was fresh and of high quality. It’s our 3rd time eating here and we sure will be back. The only wish I have is for a bigger floor space to accommodate more tables. Perfect table in the back for private conversations. My favorite sushi place in Houston (besides Uchi). Great location in the heights. Service was great. Love their wagu slim roll. A bit pricey for what you get. We were pleasantly surprised by the quality of the food at this neighborhood sushi spot. Our server, Rosie, was just wonderful. Highly recommend! Great service and excellent food. We enjoyed especially enjoyed the miso eggplant, negi maki and caterpillar roll. I was disappointed that Open Table did not award points for this dinner. Good sushi, but nothing really special. I look at this as a neighborhood restaurant worth eating at but not worth driving any distance for. If I am in the area again and want sushi, I would happily return. Our new favorite casual sushi restaurant. Will be happy to drive from midtown for the Chef's selection of sashimi. Date night for my husband and me. Fantastic experience. The food was outstanding and so was the service. I am looking forward to eating there again. Always a good choice! We keep coming back when we're in the area! Its nice to have a sushi restaurant in this area. The service was great, however, the food is rather middle-of-the-road. Not great - not bad. Not alot of creativity on the specialty rolls. The overall value for what we received was ok, just didn't get too excited about the place. Good food but portions are smaller then other sushi spots in town. Food was great, service was incredible and quick, and prices were much better than I expected. I can see how parking can be difficult, but we lucked out and got a great spot. We had a group of 13 for a birthday celebration and everyone had a great time and commented on the attentive service and excellent food. Definitely recommend for groups and we’ll definitely be back! The sushi was great especially the slim wagyu I think it was called - a wagyu beef sushi. Our waiter was very knowledgeable of the menu and was helpful and he gave great customer service. We really enjoyed our visit the food was delicious and we will definately return. I have been to this restaurant twice now. Both times have been an excellent experience. The atmosphere, food, and service are all fantastic. I am so glad we have this restaurant in our neighborhood. The sushi is always good here and we like the vibe. This time however we felt that the wait staff was working too hard to turn our table. We were in and out in 45 minutes. On a Friday night I'd rather have a more relaxed meal. There was no downtime between courses. We weren't even finished eating our edamame before the first round of sushi came out. Went here for my lunch break and it was a slow time so we were seated right away . The waitress was nonexistent. She didn’t bring my complete order . If you wrote it down I don’t see how you could forget it . The service was slow even with only 2 other parties there . It took us forever to get our check and even longer to pay . The waitress would just walk by our table and we would have to flag her down if we needed anything . We order happy hour foods, they were all delicious. Had family get together and enjoyed the appetizers, entrees and drinks. We all shared raw oysters, sashimi and sushi. Their raw oysters are uniquely served with a delicious topping like no where else. They have Japanese beer on tap and the unfiltered sake was the bomb.